Resources on Brooklyn: Links, books, etc. Please keep in mind that Brooklyn is a large area (73 square miles) and most of my repertoire of neighborhood tours are in the north and western segments of the borough (with the exception of Coney Island/Brighton Beach, Dyker Heights, Victorian Flatbush, Sunset Park, and Borough Park). I've gone all over the borough for private tours and am always happy to explore further. Note the map on the home page, reproduced below, lists the neighborhoods where I typically lead tours. Here's the MTA's New York City subway map. Here's the MTA's Brooklyn bus map (which also tracks the subway). A History of Brooklyn in 20 Objects, from Brooklyn Magazine. A Wall Street Journal article on "Brooklyn the Brand" and some Brooklyn products that live up to the hype. Are people truly priced out when they leave "Brooklyn"? Lots of Brooklyn does not qualify as the "Brooklyn" that gets commodified, as this essay explains. 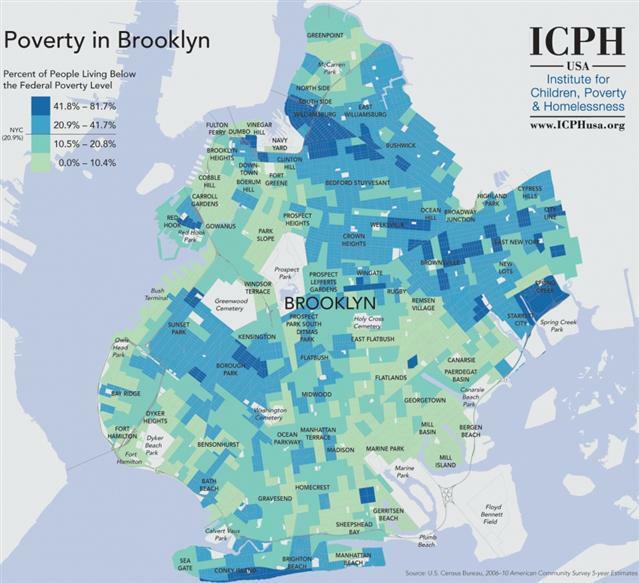 A good part of Brooklyn is getting poorer, even as other parts gentrify fiercely. Here are eight changing neighborhoods. Here's Brooklyn's 1938 redline map. 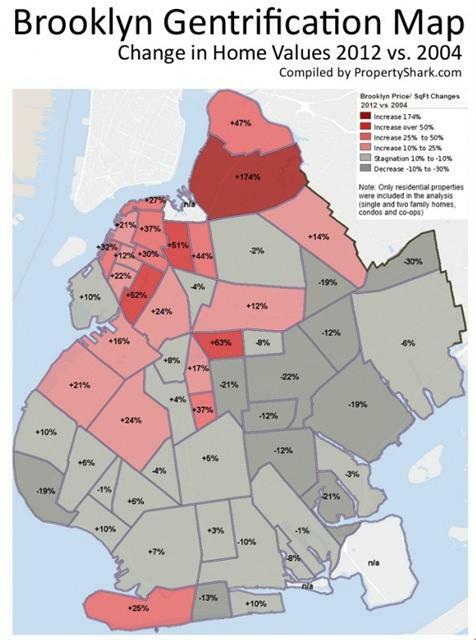 Here's a map of segregation in New York. Here's a fun one: all the places the New York Times has compared to Brooklyn. Here's an article about how some neighborhoods in film have changed. Here are a couple of essays on the "New Brooklyn" in culture. Brownstoner tracks Brooklyn real estate and neighborhood issues; Brooklyn Based offers a "guide to Brooklyn life." Brokelyn knows that Brooklyn need not always be expensive. Books set in Brooklyn, an idiosyncratic list, via Good Reads. Conde Nast Traveler's 10 Essential Books about Brooklyn. Films set in Brooklyn, via Wikipedia. A terrific literary map of Brooklyn, from the Brooklyn Public Library. A nice essay about leaving Brooklyn. GQ's gush about Brooklyn food ("the coolest city on the planet"), and Josh Ozersky's curmudgeonly response. 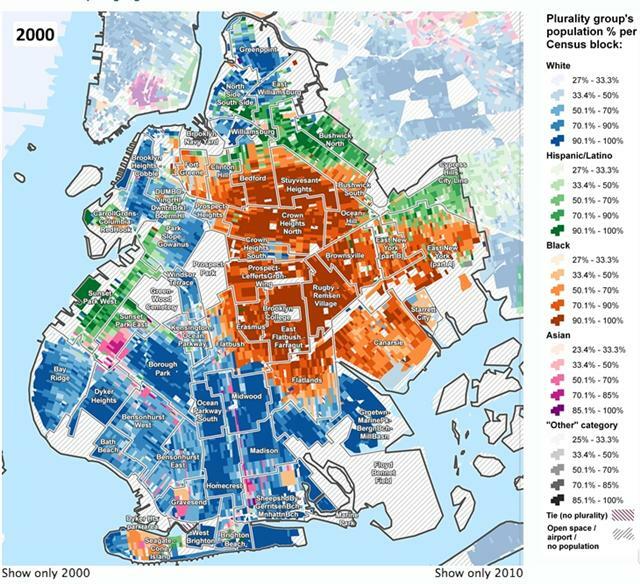 This map from the New York Times (https://nyti.ms/2NN2j6G) shows the few neighborhoods, in red, that supported Donald Trump in the 2016 election: most were Orthodox Jewish/Hasidic enclaves, but also areas with white ethnics like Bay Ridge, Manhattan Beach, and Marine Park. 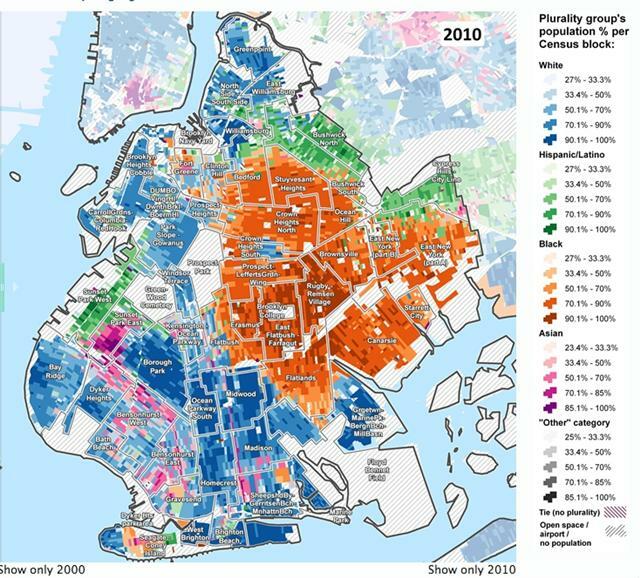 Map via NYC Department of City Planning. 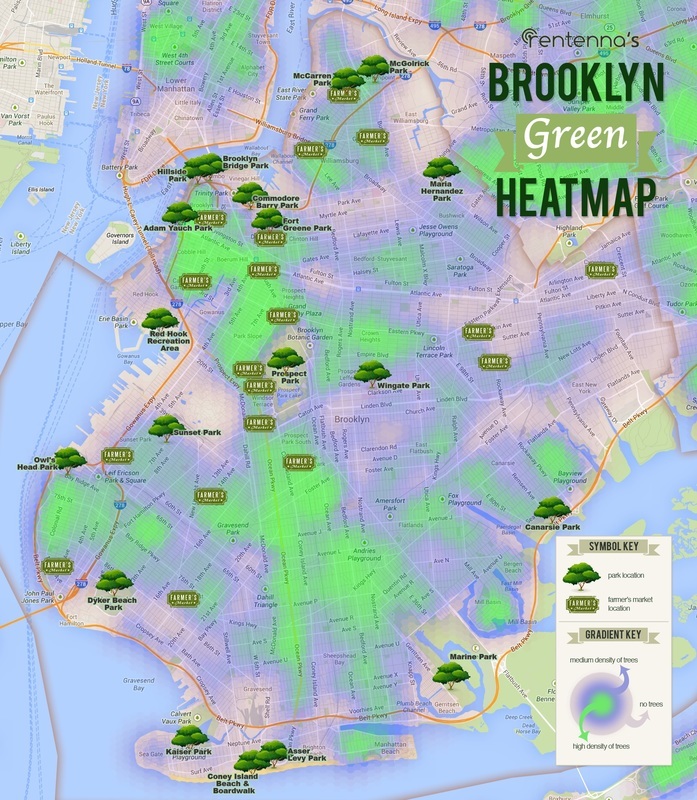 The Brooklyn Green HeatMap, from Rentenna, focusing on street trees, parks, and farmer's markets.